This Bootstrap Crowdfunding platform template is a clean and minimal Bootstrap 4 based theme. It uses JQuery and Swiper to create a carousel resembling that of kickstarter. Bootstrap Crowdfunding is a clean theme that developers can use to create their own crowdfunding platform. It uses the cleanest of code, without any bloated styles to make developing and dissecting the theme components a breeze. It also includes multiple pages for the user account to guide them through the different steps involved in creating a new campaign. It also has page templates for the user account section so they can manage their profile, passwords etc. 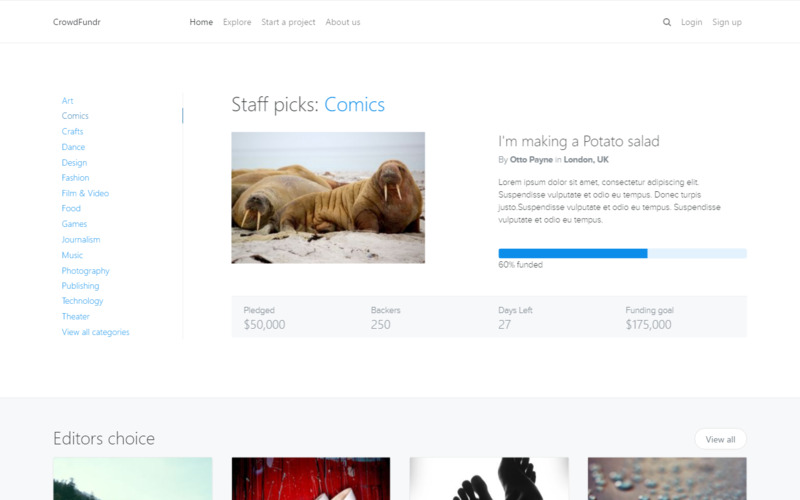 The theme demonstrates the use of a KickStarter like carousel to showcase Campaigns. It makes use of the Bootstrap 4 Cards to style individual campaigns. There is a multi-step submission page to create a campaign. If you're looking to create your own crowdfunding template, this will save you plenty of time and give you a great starter framework. Don't forget! Because you're using a theme built with Bootstrap 4, you get access to everything in the Bootstrap component library and ecosystem. This makes Bootstrap Crowdfundr an excellent choice for your next project.